Hello I am new on this forum but have been doing the shovelglove for awhile now. It is a great system. I live in Thailand and it is rainy season, so shovelglove is a great idea for working out inside. My girlfriend made a crochet cover for entire sledgehammer so I don't even use sweater for hammer head as it has crochet cover for head. 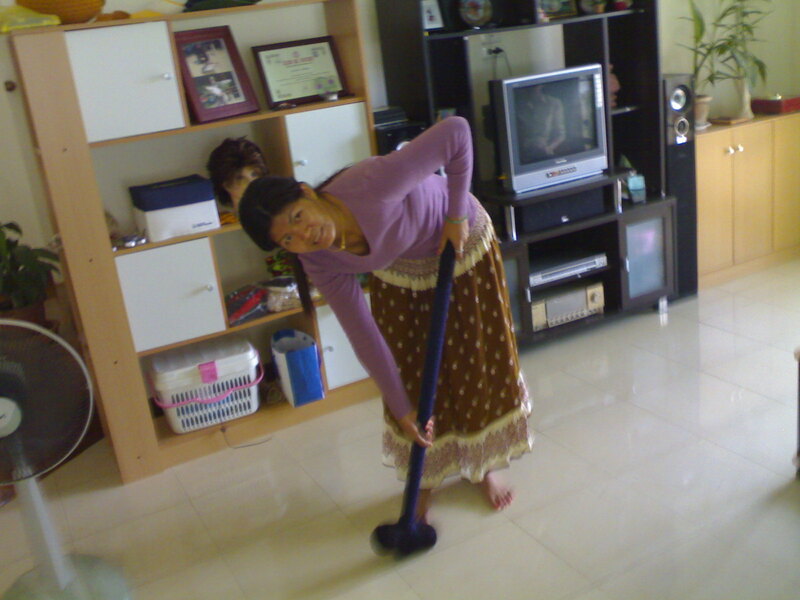 It is beautiful blue hammer now and my girlfriend and her mother ,who is 75 years old, do shovelglove every day. How terrific--what a global board we are. Love the idea of your girlfriend's mother swinging that shovel! Yes thank you very much. Today mother did 100 woodchopping swings which is good since she is 75 years old and has arthritis. She and my girlfriend do every morning and they do movements I never heard of but it is good exercise. 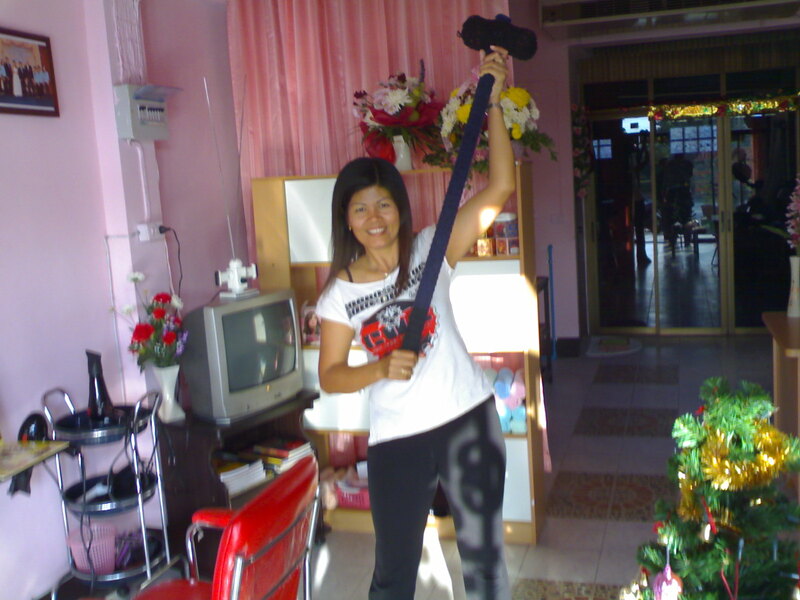 Now mother is going home to Nakhon Sawan and wants the hammer to take so I gave it to her. My girlfriend has crochet business so she covered entire hammer with crochet so it won't scratch floor and handle is very good to grip. No blisters or splinters. Today my girlfriend's brother came and did shovelglove too and I believe the whole village both in Chiang Mai and Nakhon Sawan will be doing it as people are too poor and busy for gym but everyone has a sledgehammer. Any chance you could post pictures? Not sure what I want most -- your crocheted hammer, your 75 year old mother in law, or a whole village in Thailand doing shovelglove! Thank you very much. I do not know very much about computers but I will ask friend and try to send pictures. 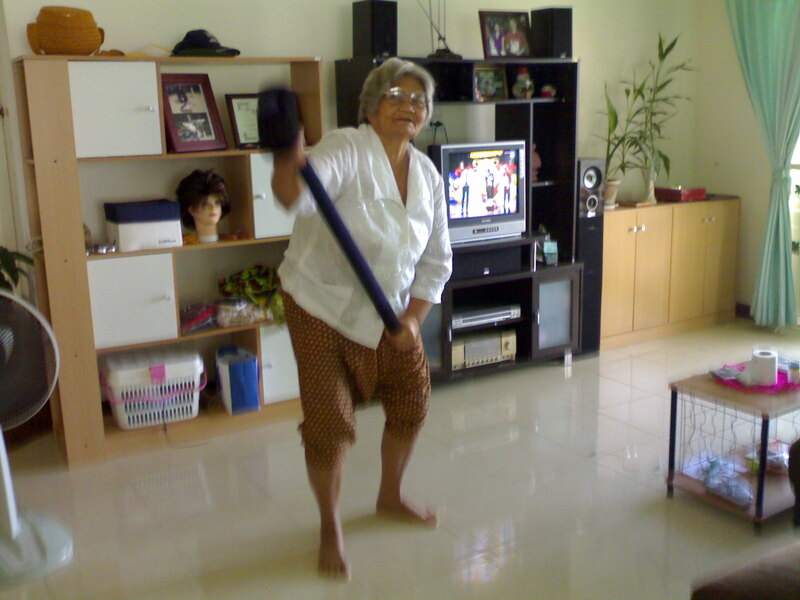 Today another lady from village did shovelglove exercises and she loved it too. Now my girlfriend is making a new crochet hammer and people are ordering them in different colors. One lady says she will use it for scratching post for cat when she is not doing the shovelglove. Incidentally reason I started shovelglove is because I was in hospital with high blood pressure and doctor says I needed to stop lifting weights, which I have been doing for over 35 years. It is important for me to stay strong as I work on mountain rescue team and sometimes have to carry heavy people through jungle. I get exercise working on my farm but only in planting season. So shovelglove lets me keep strong and also lowers my bolod pressure. However I must confess I do not exactly follow program as I do it for 33 minutes three or more times a week instead of 14, but this is same total minutes. I also do elliptical machine at gym. I will try to send pictures today. That is also very cool to know! Let us know if your experience with actual farm and mountain rescue work inspires any new moves. The 14 minutes is important for people (the vast majority, I think) who have trouble motivating to exercise consistently. It doesn't sound like that's your problem, to say the least. So what you're doing sounds like it makes perfect sense. These movements are from martial arts so this does not really answer your question, but I make like figure eights with hammer. I do this with both arms and then each arm one at a time. You need lots of room for this so if you do it be careful. This is good for your wrists, forearms and shoulders. Also, I think this is not part of shovelglove workout as it is outdoors, but I have old tractor tire and used to pound on it with sledgehammer. I cannot take credit for this as I know of other people who do it. However, I haven't done this lately as my hammer has crochet head now for shovelglove but I need an outdoor hammer anyway for the farm. Now I have to buy 2 hammers as my girlfriend's mother is taking my crochet hammer. Marisa is making a red, white and blue cover for my next shovelglove hammer. 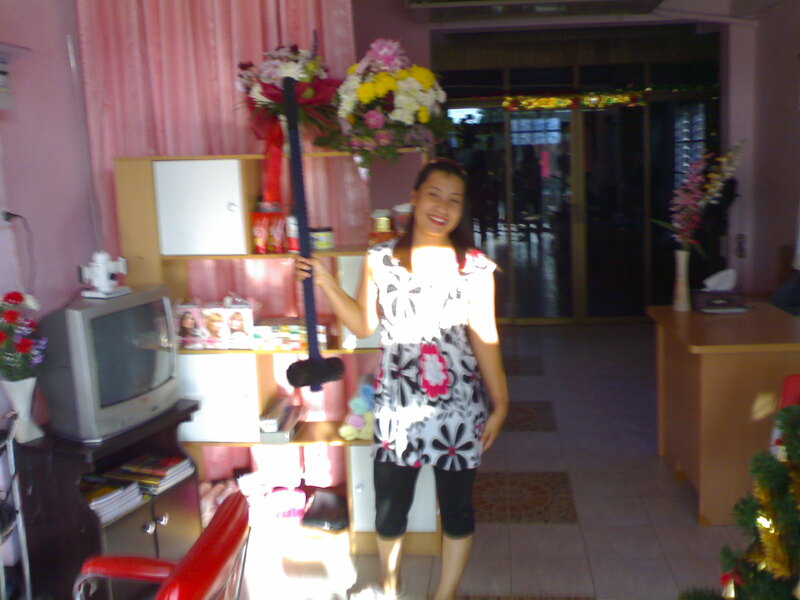 I took picture of hammer next to Buddhist shrine in my house and I will try to send photo. Also it is very cheap to do shovelglove in Thailand. Sledgehammer only costs five dollars in US money. Thank you Reinhard for posting photos. Marisa and mother are like celebrities now and whole village came to house to look at "models" from Nakhon Sawan on internet. They are very excited with idea people from all over world can see their picture. Yes tripitaka it is 10 pound hammer. Marisa and mother worked in rice fields most of their lives and Marisa worked at construction site carrying 100 pound cement bags, so they are pretty strong. I love the photos! Thanks so much for sharing them. Thank you Jules and also Deb. I like to share the photos and also it is fun because Marisa and mother do not understand what forum is or internet and think they are models now like Cindy Crawford and want to buy new clothes for next photo shoot. Bravo! I hope I manage to be so tough at that stage of life! You will surely be tough at any age as long as you keep doing exercises. Thank you Reinhard for posting photos. Thank you all for sending them! Marisa and mother are like celebrities now and whole village came to house to look at "models" from Nakhon Sawan on internet. Thank you Reinhard. Now I have to keep my crochet shovelglove hammer locked up because I have 3 kittens who use it for scratching post. I recently had to do a lot of actual shovelling doing farmwork and I believe the shovelglove has kept me in good shape for this as I used to have a sore back next day after shovelling but this time had no pain at all. I had a party at my house for American Independence Day and at the party I showed people my crochet hammer and how to do shovelglove. There was an old Japanese guy and young British guy at party and they both tried the shovelglove exercises and loved them. Especially the Japanese guy, who although he is over 60 is in good shape and exercises everyday. He tells me he wants to get a hammer and start doing shovelglove so it is getting to be really international. This thread made me very happy! I love discussions of useful, lifelong fitness, and this thread is all about that very thing. Thanks, Chiangmaiboss! This has cured my Monday blues. Thank you very much also Storm Fox. It is funny to read this message now as it is 6am and monks are doing Buddhist chant which says "You do good, you get good". So I am glad I could do some small thing to make someone happy. Hello Reinhard and everyone in shovelglove. I have unretired from shovelglove as my back is very much better. I have to get back into exercise again because I took physical for life insurance and failed because of high blood pressure, which was good before I hurt my back. So even though I kept walking a great deal as I described in urban ranger forum, this is not enough apparently so I am back to the gym and back to shovelglove. I now own a business which is beauty parlor on first floor, Thai traditional massage on second floor and community service society on third floor. Marisa runs beauty salon and works there, and her and Mae who works there do shovelglove with the crochet hammer when not busy. I will now attempt to send more photos, but have to do on email because I do not know how to do it with this forum. I'm so glad to hear it. And thank you for sending the photos! Thanks Reinhard. If you look at picture on wall to left in photo this is Marisa's graduation from beauty school. The guy with no hair who looks like Quasimodo is me. I am taller than I look in photo because it is considered to be good manners in Thailand if, when standing next to someone who is shorter than you, which in my case is most Thai people even though I am only 5'10", that you hunch down like so you are not so much taller. Hello everyone. I just started shovelglove again yesterday again after about a year. I dont know if anyone remember but I hurt my back and had herniated disks so I quit for awhile. Now I am active again and doing most everything I used to do except running. I now ride bicycle and also have taken up game called squash. Yesterday I did 20 minutes of shovelglove. 5 minutes of wood chopping with each arm and 5 minutes of shvoel with each arm also and today my arms are in pain but I feel good and no problem with back. I will keep up with the exercise and also with all of you at forum. Thank you Reinhard it is good to be back. Marisa says hello to you too but Mom is back in Nakhon Sawan. Hwever I am visiting next month so will relay your message. chiangemaiboss wrote: Thank you Reinhard it is good look at the testosterone boosters to be back. Marisa says hello to you too but Mom is back in Nakhon Sawan. Hwever I am visiting next month so will relay your message. That hammer looks heavy! You must be strong!